If you’ve been a frequent reader of my blog, you’ll know that I am always on the hunt for a great Ethiopian restaurant. I can proudly say that I’ve tried (and reviewed) the vast majority of Ethiopian restaurants in Vancouver. From Fassil to Gojo Little Africa to The Red Sea Cafe and now, Axum. This cute restaurant has been on my “to visit” for a long while now, but for some reason (well, probably the fact that it’s out of my way – but almost kitty-corner with The Brave Bull. JT and I went here for dinner the other day, as we both really love Ethiopian food. We ordered a full order of chicken (yedoro wot) ($10.00) and a five items vegetarian combo on injera ($10.00). Comparatively, the portions were bigger than Gojo Little Africa but definitely enough for us. I actually wasn’t hungry. Spice level is not comparable, though. I like more spicy food than JT does and I think that’s the general flavor that I get when I have dinner at The Red Sea Cafe, or Fassil. Excellent points though – service was impeccable, the food was really great, the injera needed to be a tad more sour but I loved it overall, the place is spotless and clean, and very spacious, as you can glean from my photo (sorry it’s a tad blurry – I took it with JT’s iPhone but I need to bring my own camera when I go out). 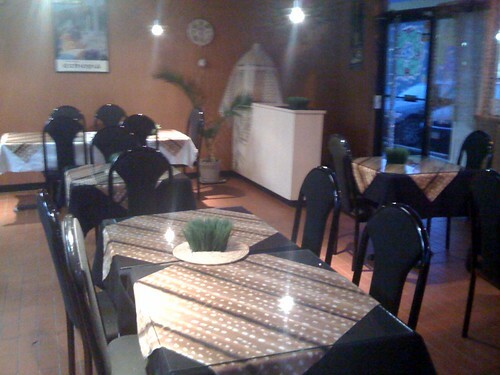 My general perception is that people DO know that Axum is a great place for Ethiopian food. However, given my proximity to Fassil and Red Sea Cafe, I can see myself going there more frequently than to Axum. Frankly, it’s astonishing the great level of Ethiopian food that we have in Vancouver. I can’t complain. Wherever I am, there will be some place that I can enjoy. I’ve always wanted to check that place out. Always seemed a curious location for an Ethiopian restaurant, but perhaps industrial workers have secret hankerings for kitfo and injera. Thanks for posting! Amazing! one still can find a mean for $10 in Vancouver. McDonald’s burger or Queznos cost more these days! Yes, Ethiopian restaurants are hidden gems. The best Ethiopian restaurants are actually in Addis Ababa. I have had the opportunity to visit Ethiopia many times. I truly enjoyed their meals. It is sad that Ethiopia is known for starvation, but I almost decided to move to Addis Ababa, but my husband did not want to move. The next best Ethiopian restaurants are found in DC area, where Presidents and Senators dine and wine.